Fourwhitepaws Kitty Village is very near completion. Unit #2, a new family sized kitty residence, was built and installed recently. 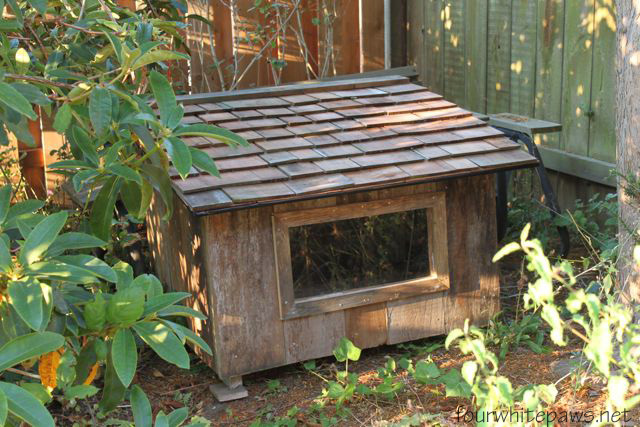 This residence is larger than the first kitty house and features a large glass picture window. It's still in need of being insulated, but there it plenty of time before the cold weather comes. I'm still trying to decide about the arrangement of the units. I like having them all somewhat together in the side yard, but I fear they may be too close together. I won't really know until I see if and how they get used. 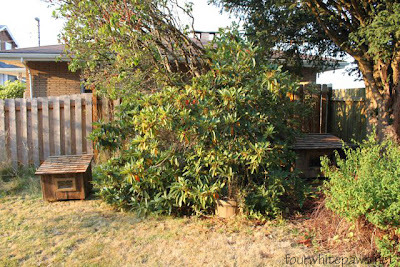 Currently, I have the larger unit in the trees in front of the swinging bench that BK likes to hang out under. 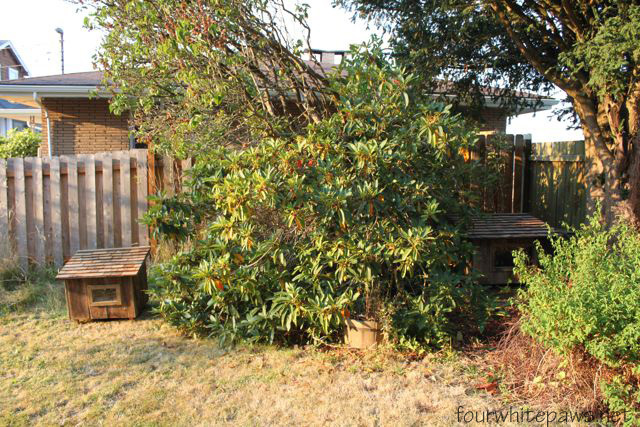 A large rhododendron bush and a lilac tree separates the two units. If you look close, Unit #2 can be seen hidden in the trees on the right side of the picture. I am guessing this will be too close together for BK and the Crooked Tail Kitty to live in harmony. I may end up moving one of the units to the back yard. Why do I suspect the units might be too close you ask? 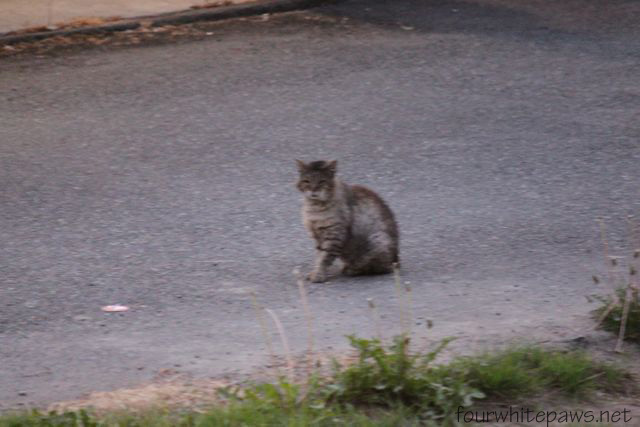 I recently saw the Crooked Tail Kitty sitting in the middle of the alley a little ways from the driveway for quite a long time, which was out of character and just plain odd. 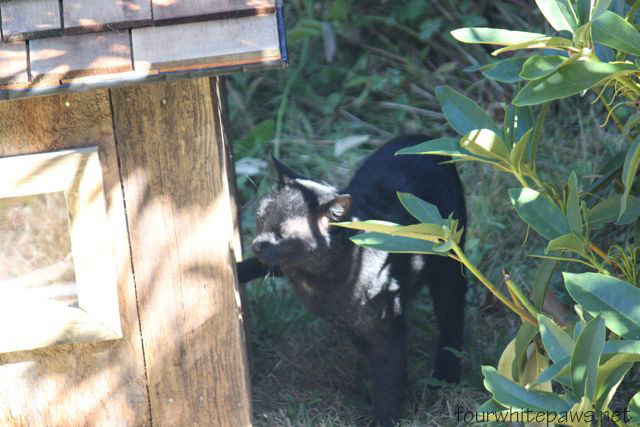 When I went out to feed it dinner, I learned why it was keeping a safe distance, it was because BK was first in line waiting for dinner to be served. 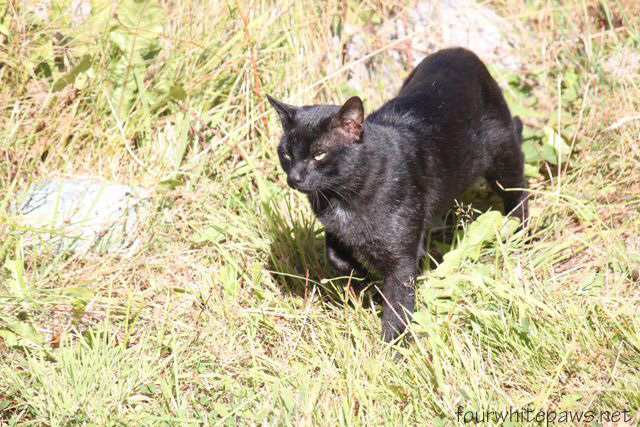 Once BK ate, she parked herself between the Dining Hall and the Crooked Tail Kitty. I don't know if Crooked Tail Kitty got it's dinner that night or not. But something tells me they are not friends. BK watching me from the Dining Hall. Coming back from the tall grasses. Checking out the accommodations again. 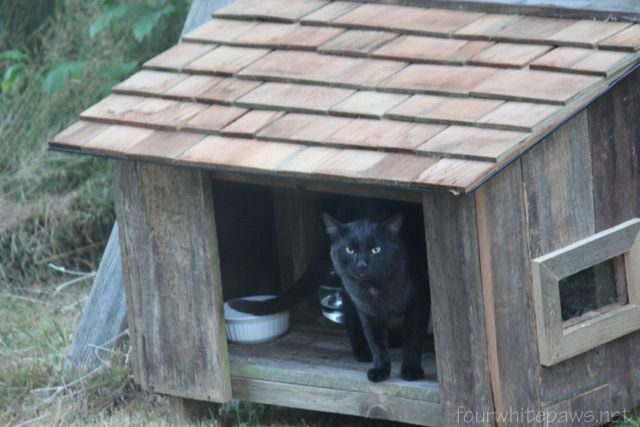 So far, since I have remodeled the first large kitty house, I haven't seen any signs of the houses being used. I'm hoping it's because we have had a nice stretch of warm summer weather, now that summer is over! Maybe when it gets colder and wetter both Crooked Tail Kitty and BK will be wanting to find a safe place to get in from the weather. Meanwhile, I keep dreaming about installing a couple of these Kane Manufacturing Poly Pet Heat Mats to keep the outdoor kitties toasty warm all winter. 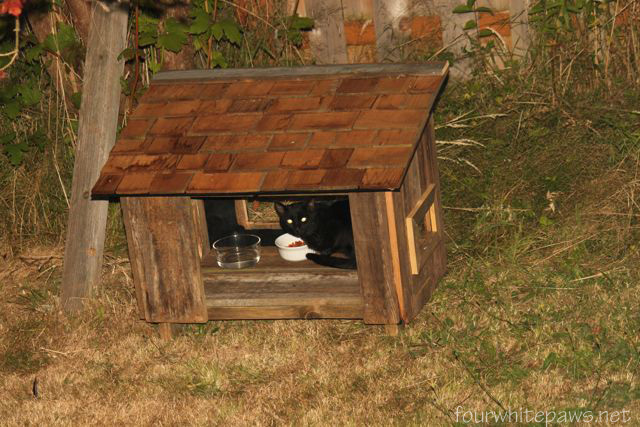 Although, if I can somehow justify buying two for the outdoor kitties, I'll need to get one for my Willow too! Meanwhile, I did something today that I never ever imagined I would do in my life. I bought a bale of straw! I needed some bedding for the kitty houses and everything I read said stray was a better choice than towels or blankets because it doesn't hold the moisture as much. So, now, my garage smells more like a barn and I got lots of bedding material. I suspect the location of the house on the right is not going to work out. They may fear an ambush due to the shrubs. It can be a work in progress. Which reminds us that we have to get mom to clean and renew the bedding in our feral houses (which don't look anywhere as nice as yours). We would keep watching and see what happens but keep in mind that cats won't like to be somewhere they can be cornered. I'd bet money that BK is defending "his" food...the front/back yard arrangement sounds like a winner. Interesting about the straw, I'll have to get some for Outdoor Henry. Last year we had a visitor kitty and we took up feeding him, Dad even built him a nice house but he never would use it. WE thought he was just too afraid. He always came for breakfast and dinner, he was a nice fella, but one day last December we saw him dash off after breakfast and we never saw him again. It is still hard we really wanted to do the right thing for him. Straw is about the best bedding around, especially as cheap as it is. (at least last time I needed a bale) It doesn't absorb water, so it doesn't freeze. 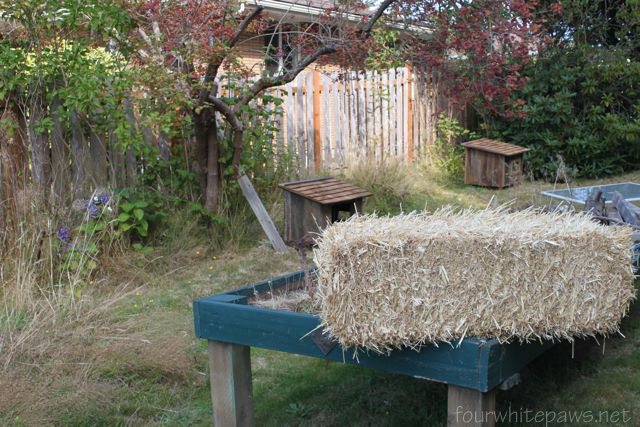 Hay, paper, towels and the like get wet and can freeze. If those houses are reasonably tight against wind and rain, they might not need much insulation. Cats will burrow down into the straw if they can, so if they can stay dry and do that, they should be fine.